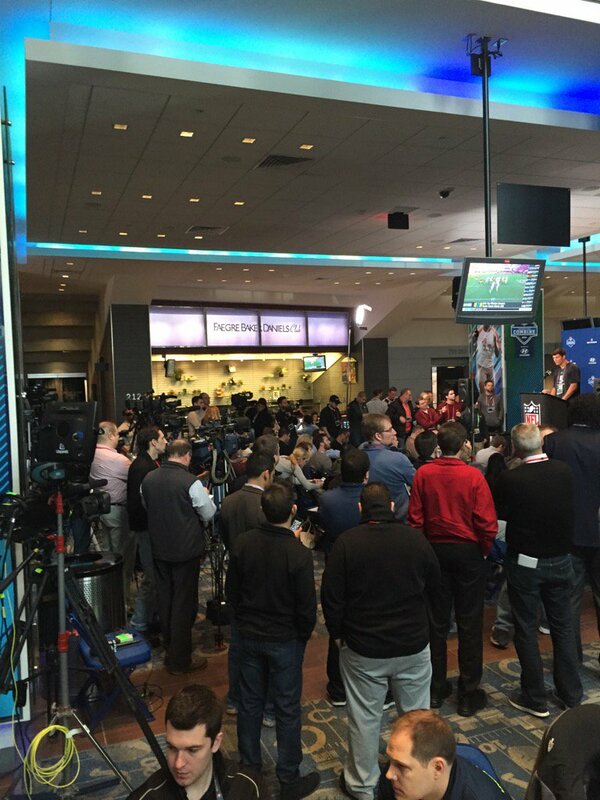 The NFL combine: Useful talent evaluations, theatre, or a little of both? This must be important. How else to explain the wall-to-wall television coverage? The fate of the free world must be at stake. You can hear it in the reverential tone of announcers as a 21-year-old man in spandex takes his mark and sprints 40 yards at the speed of light. Welcome to the NFL Combine. Never has something so meaningless ever been so over the top. Don’t misunderstand. It has a role in filling the time between the end of the football season and the upcoming NFL Draft. It is great entertainment, for one, giving the NFL Network and websites across the country live, minute-by-minute programming. It’s also a meat market. We learn that Heisman Trophy winner Derrick Henry is built like a Mack Truck. He’s 6-foot-2 ½, 247 pounds – almost the same exact dimensions of Super Bowl MVP Von Miller. Except Henry is a running back from Alabama and Miller is a linebacker for the Denver Broncos. Both should be ticketed for moving like Ferraris in an 18-wheeler speed zone. We needed to gather the top NFL-ready college athletes and combine them with coaches, general managers and scouts from across the league to learn this? Even after Henry already shattered single-season rushing records of Bo Jackson and Herschel Walker, we know the inevitable truth. Except evidence is already on film. Err, tape. Or computer files. You get the gist. I may not be a professional scout, but I knew five minutes into the College Football Playoff Championship Game that Henry could haul. I’m vastly underpaid. Do we even need the dog-and-pony show? Remember Tom Brady? He showed up at the NFL Combine years ago looking like a frat boy on spring break. Unimposing body, speed of an MBA candidate and arm strength that drew unflattering remarks.